We'll start with the latest iteration of our WiFi web browsing test. With some additional logic to defeat overly aggressive browser caching, this test cycles through dozens of web pages, pausing on each one to simulate reading time before moving onto the next one. Display brightness is kept constant at 200 nits while the test runs. Results are reported in hours of battery life before the tablet dies. Most web browsing tests end up being significantly display limited, as in the display dominates most of the power draw. That being the case, the fact that we see a 15.8% increase in battery life from the new 32nm HK+MG SoC alone is very significant. 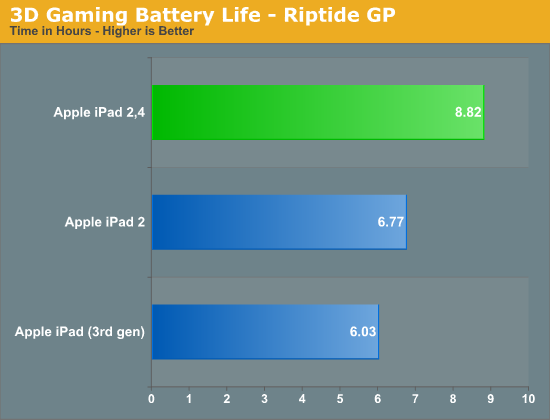 Apple is very conservative internally about revising battery life ratings so it's no surprise that we don't see a change in the specs on the iPad 2, especially considering that so many units out there on the market are still older iPad 2,1 models. The increase in battery life here is almost certainly due to lower leakage at idle and better active power as well. This is a real improvement. Things get even better when we stress the real power hog on the SoC: Imagination Technologies' PowerVR SGX 543MP2 GPU. Taking up more area on the die than the dual Cortex A9 cores, the 543MP2 is really stressed during 3D gaming. 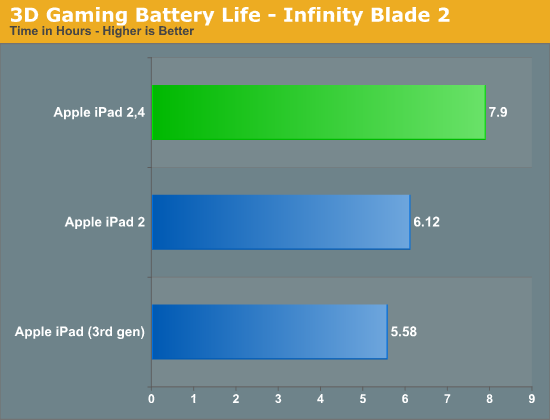 What better way to measure the impact of the new 32nm SoC on battery life than with one of the most stressful 3D games out for iOS today: Infinity Blade 2. Here we're looping through the same scene until the battery dies, once again at normalized brightness. The 3rd generation iPad obviously doesn't do as well as the iPad 2 here, as it not only has a more power hungry GPU but it's also rendering the scene at a higher resolution (and driving a higher resolution panel). What's most impressive however is just how much better the iPad 2,4 does here: a 29% increase in battery life over the original iPad 2,1. Finally we have our brand new video playback test. Here we've got a copy of the last Harry Potter movie with the credits stripped out (1:58:00 running time), transcoded to a 720p High Profile H.264 video with a 4Mbps average bit rate, playing back in a loop until the battery dies. 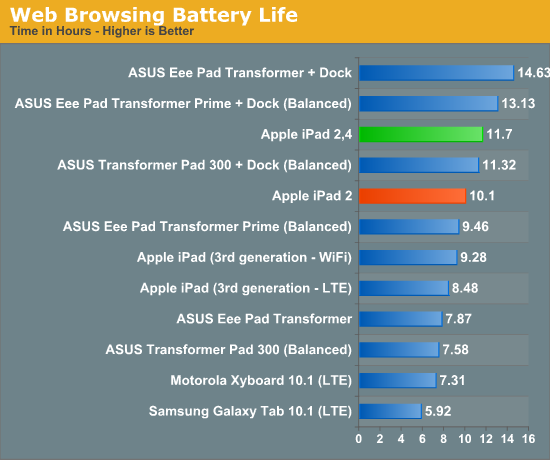 The iPad 2 holds a 19% advantage over the 3rd generation iPad (once again for obvious reasons), however the iPad 2,4 absolutely dominates with an 18% increase in battery life. At 15.7 hours this is an insane amount of battery life from a single charge. Granted end users will see lower numbers if you watch at higher brightness settings (200 nits on our test panel was around 40% brightness), but the advantage from the new iPad should still remain just as significant. How about money from patents they actually get money from. The issue is not fighting between Apple and Samsung --- there's a minor issue that they are already both trying to calm down and resolve. 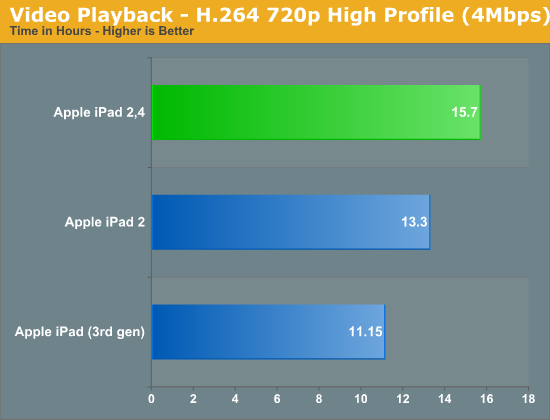 All those numbers refer to the different versions of the iPad 2. I think he's being sarcastic.